If there's something strange in your neighborhood, who ya gonna call? It seems you started your ghost removal entreprise in a timely manner, as the city is currently experiencing a strange upsurge in paranormal activity! 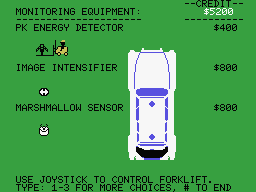 As ghosts emerge from all corners of the city and gather to bring about the return of the evil Zuul, you must capture the ghosts with your nuclear-powered gear, and earn money in the process to keep your ghostbusting operation running. As you fight against the clock (and more importantly, against the city's ever-rising psycho-kinetic energy level), you must manage money and tech resources and stay one step ahead of Zuul. Show 'em you ain't afraid of no ghost! Eduardo Mello and myself had discussed porting the MSX version of this classic game to the ColecoVision several times in the past, but the project never managed to take off, mostly because we both felt there were more interesting MSX games to port. But all that changed in the fall of 2012, when it became clear to me that working on The Black Onyx project wasn't as much of a priority for Eduardo as it was for me. So I asked Mystery Man if he was interested in completing the port of The Black Onyx. I was quite happy when Mystery Man accepted, but this left some loose ends with Eduardo, because we had a private deal going that Eduardo didn't want to give up on. I just told him that there were many other projects that we could do together, and our ongoing private deal could live on in another form. 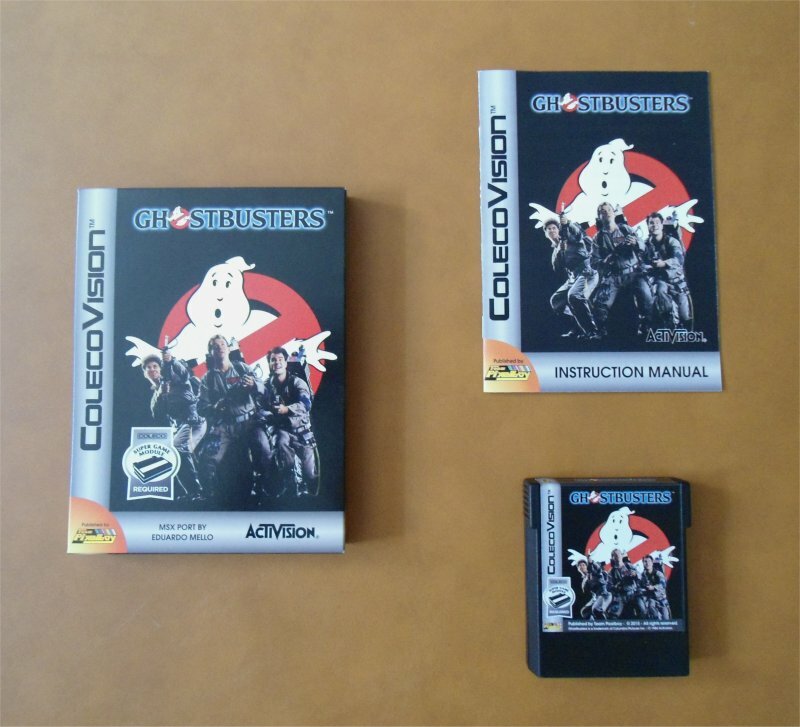 That's when Eduardo suggested porting the MSX version of Ghostbusters to the ColecoVision. 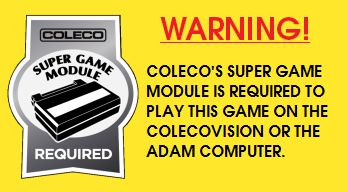 That seemed perfect to me, especially with the Super Game Module now a true product available to CV fans. So Eduardo did the port over several months in 2015, and Mystery Man stepped in to fix a few bugs in the software in 2017. Team Pixelboy is proud to take part in the ongoing effort to provide more games for the owners of Opcode's Super Game Module! SPECIAL THANKS: Reinhard Traunmüller, Dan Michaels, Christian Martin, Kendal Mertens, Jim Notini, Albert Yarusso, and all AtariAge forum members. 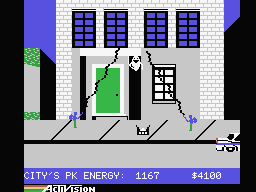 Here is a YouTube video of the MSX version of Ghostbusters. 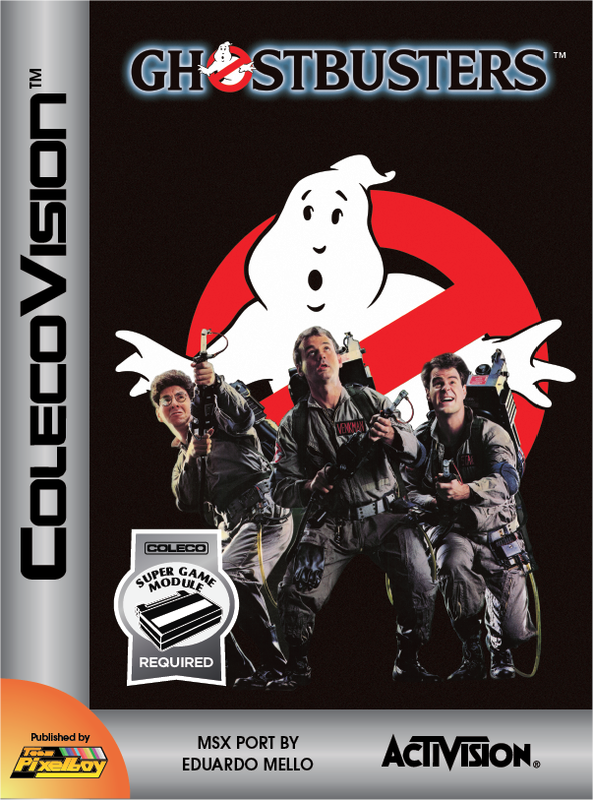 The ColecoVision version looks, sounds and plays the same as what you see below (note that the sound is severely low in this video, so you need to set the volume of your computer speakers to maximum).